Emine is a Mathematician. Her previous work has been on constructing and analysing highly-accurate numerical methods for the approximate solutions of elliptic and parabolic partial differential equations in complex geometries. These included problems in fluid dynamics such as two-phase flow problems, for which the numerical simulations were obtained using newly developed methods based on the conforming finite-element method. As part of the team in the Bioacoustics and Sensory Biology lab, she will be transferring these skills to the mathematical modelling and the numerical simulation of the workings of the inner ear of the bushcricket (katydid). Due to the unique structure of this bushcricket’s ear, which is very similar to the structure of the mammalian ear, this work is designed to contribute to the expanding array of insect-inspired technology. Emine is an associated researcher in our large-scale ERC consolidator grant. Sarah is the Bioacoustic and Sensory Biology Lab’s 3D imaging specialist. New to the field of insect bioacoustics, Sarah’s previous work has involved working with engineers and sports scientists to image the human remains of the Mary Rose using micro-CT. This method uses powerful X-rays to generate high resolution 3D volumes that include all the important internal data. She plans to use the same method to continue the lab’s work mapping the bush-cricket auditory system, but expand it to include other techniques including infinite focus microscopy for topographic detail, and laser Doppler vibrometry for various mechanical measurements. A large proportion of Sarah’s work will focus on the vibrations of the inner ear of glass bush crickets. The uniquely transparent body of these insects allows for the laser to pass through the skin and resolve the vibrations of the surface of the animals’ inner ear directly, and noninvasively. This work hopes to ultimately inform on future research involving the human cochlea. Ben is definitively not new to the lab. He did his BSc. dissertation project in our lab, and completed his MSc by research in January 2015. During his undergraduate project Ben found stronger correlations between the structure of the stridulatory file-teeth and the quality of the signals (broadband or pure tones) that male katydids produce, across different species. His MSc project focused on studying the sound field in stridulating crickets. Since tegminal stridulation is a mechanically asymmetrical process, Ben tested the hypothesis that the sound field around a singing cricket is also asymmetrical. To test this hypothesis he used neurophysiological techniques to elicit stridulation in crickets, opto-motor detectors, and condenser microphones controlled by a robotic arm around the singing insect. In January 2015 Ben enrolled in a PhD program in the lab, and his work will compliment a larger project sponsored by the Leverhulme Trust. Using µ-Scanning Laser Doppler vibrometry, and modern comparative analysis across nearly 500 species he is conducting a massive scale study of stridulation and wing mechanics across different species of katydid. Data collected by Ben will serve to implement biophysical models of wing vibration in fossil specimens. Christian projects involve measuring the mechanical contribution of the multiple acoustic ports to a single ear (each ear receives input externally from two tympanic membranes and internally via the acoustic trachea). His experiments require a setup of three laser systems. Two portable laser units will record vibrations from each tympanum of one ear, while a micro-scanning LDV will record from the inner ear though transparent cuticle. These experiments will involve several katydid species with variable ear morphology to account for variability in the three ear components. This comparative approach enables the acquisition of data on directional hearing, and active and passive amplification. It is known that while some species rely on the outer ear (the acoustic trachea for passive acoustic amplification) others do not use this mechanism. Acoustic trachea of Copiphora gorgonensis segmented using µCT-scanning. ​Daniel is the Bioacoustic and Sensory Biology Lab’s research technician and currently is also enrolled as MSc by research student. 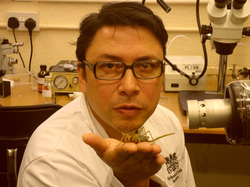 Having been involved with specimen collection in Ecuador, he is now responsible for maintaining colonies of the various bush-cricket (katydid) species held at the University of Lincoln. Jacob is using one of our state-of-the-art imaging technologies, the infinite focus system, to accurately measure the structure of the stridulatory file in the field cricket Gryllus bimaculatus. Crickets exhibit stridulatory file in both forewings, however, only that of the right wing is used in sound production. He is testing the hypothesis that both files should have differences in structure due to selection pressures. Georgea is conducting a comparative analysis of vocalisation in felids. Her project involves the spectral analysis of several call types (e.g., mew, meow, hiss, growl, etc) within the same species and across several species. Calls with be obtained from databases of animal sounds and repositories. Robert is interested in the biomechanics of lapping in dogs and cats. His project involves the use of high-speed video cameras to obtain footage of dogs and cats drinking water.